"Assisted living properties continue to comprise the majority of the seniors housing units under construction,” said Chuck Harry, NIC's chief of research and analytics. 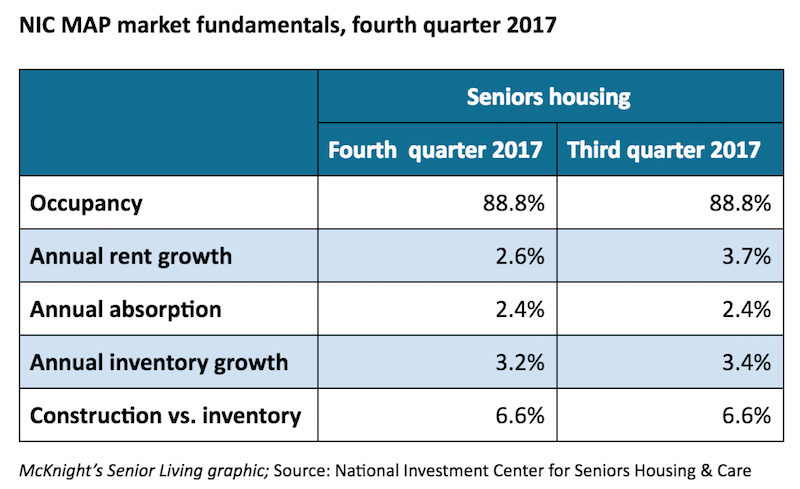 Occupancy, annual absorption and construction as a share of existing inventory in senior living remained unchanged in the fourth quarter compared with the third quarter, the National Investment Center for Seniors Housing & Care said Thursday as it released fourth-quarter performance data captured by the NIC MAP Data Service. The annual inventory growth and annual asking rent growth rates were down compared with the previous quarter. The occupancy rate averaged 88.8% in the fourth quarter, down 0.7 percentage points from year-earlier levels. The rate was 1.8 percentage points above its cyclical low of 87% reached during the first quarter of 2010 and 1.4 percentage points below its most recent high of 90.2% in the fourth quarter of 2014, NIC said. In assisted living, occupancy averaged 86.5% during the fourth quarter, down 1 percentage point from year-earlier levels. In independent living, it averaged 90.6% during the fourth quarter, down 0.5 percentage points from a year earlier. Annual absorption was 2.4% as of the fourth quarter, down 0.1 percentage point from a year earlier. The inventory growth rate of 3.2% was down 0.2 percentage points from the third quarter. NIC Chief Economist Beth Burnham Mace called the occupancy rate “relatively weak” and noted that inventory continues to outpace demand. Preliminary data on construction as a share of existing inventory for seniors housing remained at 6.6%, down 0.4 percentage points below its recent high of 7% in the third quarter of 2016. Construction starts within the 31 primary markets during the fourth quarter preliminarily totaled 6,069 units. That number included 2,758 independent living units and 3,311 assisted living units. On a preliminary, four-quarter basis, starts totaled 20,686 units. Construction start data often are revised retrospectively in subsequent quarters as additional information becomes available. During the fourth quarter, the average rate of seniors housing’s annual asking rent growth was 2.6%, down 0.1 percentage points from the previous quarter and down from 3.7% in the fourth quarter of 2016, NIC said. By comparison, labor expense growth as measured by the annual change in assisted living average hourly earnings was 5.3% in the third quarter, according to the Bureau of Labor Statistics.